The USTA Southern Wheelchair Tennis Committee is devoted to the growth and development of wheelchair tennis in the Southern Section. 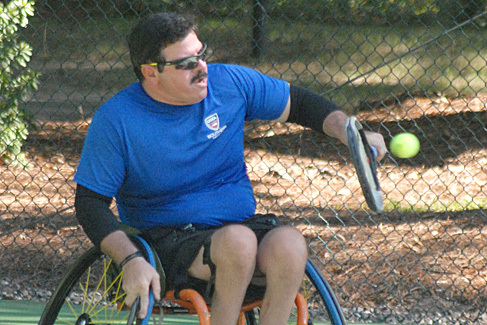 The USTA Southern Section has long been a leader in the growth of wheelchair tennis. The first tournament was held in Atlanta in 1983. The following year the tournament was taken over by ALTA, the largest individual tennis association within the United States. In 1984 Nashville, TN and Natchez, MS held tournaments and in 1985 the Roho/PTR was introduced. These tournaments continue today and are sanctioned by the International Tennis Federation as well as the USTA and remain the top tournaments in the Section. The staff at USTA Southern, wheelchair committee members, state coordinators, teaching pros and the many volunteers have been responsible for the success of tournaments and programs the Southern Section now enjoys. With 104 players representing 17 countries, the 22nd annual Cajun Classic Wheelchair Tennis Tournament ran through March 27 at the Paula G. Manship YMCA’s Lamar Tennis Center, Baton Rouge, La. Click here to read more. Click here for photos by Liz Heath. Mackenzie Soldan's status as American's No. 1 junior wheelchair player is the subject of an extensive article on www. MaxPreps.com. The story, writen by Dave Krider, features a photo and detailed descriptions of her career in both tennis and basketball. Soldan is a senior at Christian Academy in Louisville, Ky.